852354 Asajj Ventress Key Chain is a Star Wars: Star Wars: The Clone Wars set released in July 28 of 2008. 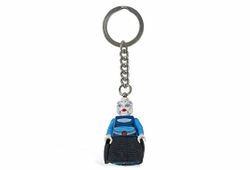 It includes an Asajj Ventress minifigure with a key chain link attached to its head. Like all keychains, the minifigure cannot be removed. This is a description taken from LEGO.com. Please do not modify it. The sinister Sith guard these keys! A powerful warrior and agent of the Sith, Asajj Ventress has arrived from the Clone Wars to protect your keys from any who would dare try to take them. Sturdy metal key chain includes authentic LEGO Star Wars minifigure and plenty of fun! Makes a great gift for any LEGO or Star Wars fan! Facts about "852354 Asajj Ventress Key Chain"
The sinister Sith guard these keys! A powerful warrior and agent of the Sith, Asajj Ventress has arrived from the Clone Wars to protect your keys from any who would dare try to take them. Sturdy metal key chain includes authentic LEGO Star Wars minifigure and plenty of fun! Makes a great gift for any LEGO or Star Wars fan!